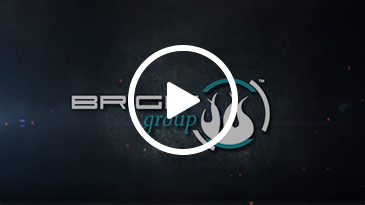 A comprehensive range of high quality turnstiles allows ALLTECH to cater for a variety of applications, ranging from corporate reception foyers and recreational areas to low security industrial installations. 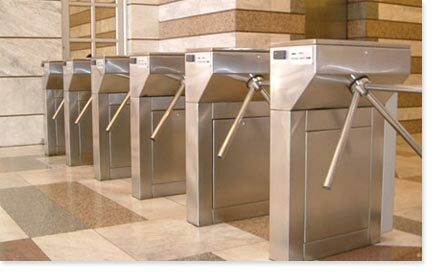 The turnstile arms are locked in position by solenoids rated for continuous operation. The arms are released for one cycle (movement to allow one pedestrian entrance/exit) by activation signal from a number of sources, e.g. coded cards, push buttons, coins, key, computer, etc. 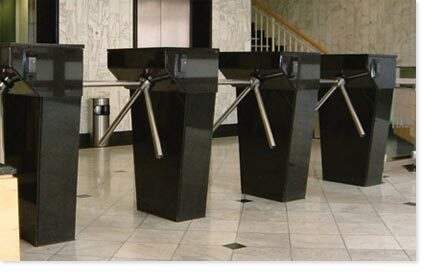 The turnstile arm spacing and movement is designed to ensure a single entry/exit per legitimate activation signal. Internal mechanisms return the rotating arms to the locked position after each rotation. Numerous turnstile finishes, e.g. Powder-coated, stainless steel, marble, etc., to clients requirements. Rotating arms run on maintenance-free sealed bearings. Free movement on power failure. Activation device mountable on cabinet. Automatic return of rotating arms to locked position after activation. Solenoids rated for continuous operation.